The Agilent 71200P is identical to 71200C, but replaces the mainframe display with a high performance HP Vectra PC and the display software. The key features of the “P” systems are capability for output to PC printers and mass storage devices and lower system price. 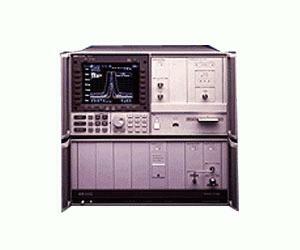 The Agilent 71200C microwave spectrum analyzer offers a wide variety of price and performance options and a frequency range of 50 kHz to 22 GHz. The standard configuration gives unpreselected microwave capability at just over the price of an RF analyzer with similar performance in terms of speed, phase noise, and feature set. If you make RF measurements and occasionally view microwave signals, this analyzer may be ideal. Or, if you measure known signals in a controlled environment such as manufacturing, this analyzer offers high performance at an economical cost. To measure several unknown signals or spurious signals, preselection is recommended. It will eliminate the multiple and image responses that occur in microwave harmonic mixing, saving the time it takes to identify unknown signals. And for coverage to 325 GHz, you can add an Agilent 70907B external mixer interface module. The Agilent 70620B preamplifier modules can be used with the 71200C spectrum analyzer for improved sensitivity. Option 001 on the Agilent 70620B provides coverage down to 100 kHz.